This is a really great product but it is hard to say why. If you have a strong case of eczema, I would recommend this, but at the same time I would also recommend something else. This is not to say that this is not a great product, but because of its nature as a body wash, it cannot be directly applied to skin. It can be rubbed in very strongly, but it cannot be directly applied and left on like you can do with a lotion or any other product. 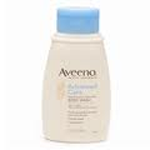 Contains essential body wash ingredients but also has colloidal oatmeal which helps to soothe burning skin. This really was a great product for me. It felt very smooth on my skin and was a very great alternative to other body washes which were a little too harsh and made my skin burn even more. However, saying that this is a good product for getting rid of the symptoms of eczema would be incorrect. It does help to make the sensation of washing my skin less painful because it is ultra smooth, but the body wash alone will not be enough to help cure the strong case of eczema that I deal with every day. So would I recommend this to someone with eczema, yes, but I would also recommend that they use another product after they get out of the shower to help seal up the irritated areas for the rest of the day.